Eugene Joseff began his company in the late 1920s as he noted period inappropriate jewelry being used in Hollywood movie costuming. Working with costume designers like the famed Walter Plunkett, he was instrumental in remedying this problem in films from 1928 until his death in 1948 when the plane he was piloting crashed. His wife, Joan Castle (shown above), continued to run the company after Eugene’s death. She not only stayed committed to renting jewelry to all the major Hollywood studios, she also kept the airplane parts division of Joseff of Hollywood established during World War II alive as well. Joan oversaw the company until her death in 2010 when the reins were passed to her daughter-in-law Tina Joseff and granddaughter Michele Joseff. Jewelry crafted by Joseff of Hollywood has always been produced using a trade secret matte Russian gold-colored plating that worked well under the lights of Hollywood in terms of reflecting light. It is also easier to photograph in still shots than jewelry with high gloss finishes. “Gone with the Wind,” “Gentlemen Prefer Blonds,” and “Cleopatra” featured Joseff jewels worn by their glamorous leading ladies, along with many, many others. Actors such as Douglas Fairbanks, Jr. and Vincent Price wore Joseff pieces in period pictures as well, and even the cigar case Clark Gable used when playing Rhett Butler was crafted by this Hollywood institution. While the Joseff jewelry used in movie production rarely came up for sale in the secondary collectibles marketplace in the past, that changed in 2017. Julien's Auctions sold the collection in November of 2017 at their Beverly Hills location. The collection toured earlier in the year before being auctioned off piece by glorious piece. A book about the collection was being produced by Michele Joseff to coincide with the sale. The company will continue to sell their retail lines to wholesale customers, as noted below. In the late 1930s, Joseff of Hollywood branched out to create a retail line that was sold in major department stores like Saks Fifth Avenue, I. Magnin, Bullock’s, Neiman Marcus, Marshall Fields, and Nordstrom’s. Eugene Joseff flew from city to city delivering jewelry to gain publicity for the venture, and he assisted in putting together clever window displays showing off the new lines. Joan Castle Joseff, his wife, continued to support the retail jewelry business when she took over the company after his death in 1948. 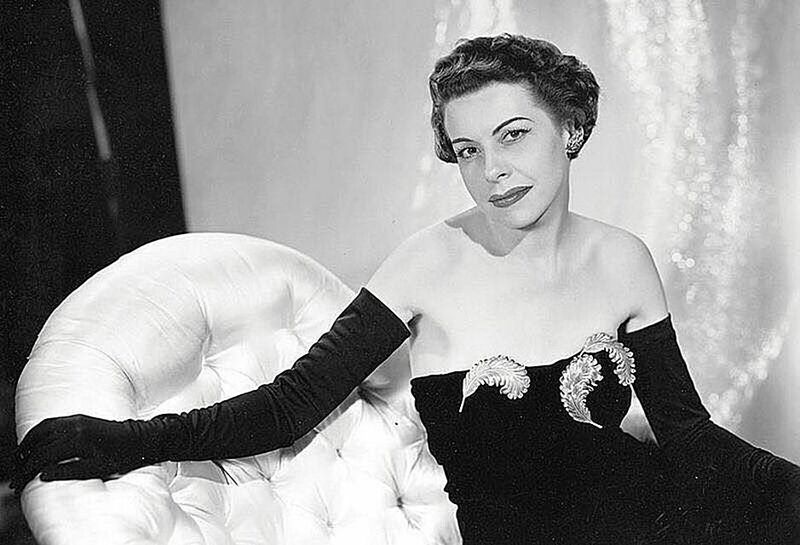 A New York Times article from 1950 based on an interview with Mrs. Joseff stated, “as with everything seen on the screen, Joseff creations, too, influence fashion. The more successful pieces are adapted for the ‘commercial line’ – sold in one big store in each city.” Some of these designs were exact copies of jewelry worn in the movies, but many others were variations made exclusively to market to retail clientele. While costume jewelry manufacturers like Coro were producing millions of pieces of jewelry each year during their heyday, in comparison, Joseff’s early retail lines were made in quantities in the thousands. With limited numbers of each style made and very limited distribution, collectors clamor to own these hard to find beauties today. The earliest pieces from the ‘30s and ‘40s, like the large flower brooch shown here, are marked “Joseff Hollywood” or just “Joseff” (depending on the style) in block letters. Joseff of Hollywood is still designing and marketing jewelry today with Tina Joseff and her daughter Michele Joseff overseeing production. These are not reproductions, but actual items being sold from the Joseff warehouse. Some are from the original retail lines being discovered in the warehouse with the old Joseff Hollywood block mark. Others are made (and have been for literally decades) with original vintage components and stones purchased by Eugene Joseff warehoused since the 1930s and ’40s. All Joseff jewelry is plated with the Russian gold-tone finish formulated and first used in the late 1920s, and production runs are still very low in comparison to mass-produced contemporary costume jewelry. As the company’s stockpile of vintage components is depleted, some styles are slightly modified or they may be retired completely. As of 2013, Joseff reported they were no longer using silver plating, in fact. Joseff is largely a wholesale business at this time, selling to select boutique retailers today. All the newer pieces are marked with a round signature plaque reading “Joseff” in script lettering with the exception of items like the exotic jeweled elephant brooch where the script mark is incised directly into the metal. The round mark has changed slightly over the years. The one used in the 1950s and ‘60s (after the older block lettered mark was discontinued) is a bit messier looking in terms of how the letters are formed in comparison to the newer version. Another telltale sign of a more recent Joseff piece is the lack of patina the jewelry naturally develops as it ages and is worn. The piece that is shown above, the Sun God, was Joan Castle Joseff's favorite brooch. The original was made of 18-karat gold with diamond eyes. It was produced as part of the company's original retail line in the late 1930s and is still part of the company's wholesale offerings today.